Brazil's carmakers sold more vehicles adapted to run on alcohol last year than conventional petrol-driven models, motor industry figures show. 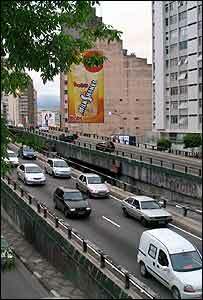 "Flex-fuel" cars, which run on any combination of ethanol and petrol, took 53.6% of the Brazilian market in 2005. Brazil has made ethanol-driven cars for 25 years, but they have not outsold conventional ones since the late 1980s. Brazil produced a record 2.4 million vehicles last year, 1.7 million of them for the domestic market. In all, 866,267 flex-fuel cars were sold in Brazil in 2005 against just 328,379 the year before, the Brazilian motor manufacturers' association Anfavea said. Brazil began its Pro-Alcohol programme more than 20 years ago to promote the use of ethanol, derived from sugar-cane, as an alternative fuel for cars. At the time, Brazil had a military government, which wanted to reduce the country's dependence on imported Middle Eastern petroleum after the 1970s oil shocks. The idea fell out of favour in the 1990s after sugar prices rose and the price of oil fell, while Brazil's state oil company Petrobras discovered new offshore oilfields which reduced the need for imports. But in 2003, a new generation of cars capable of running on alcohol entered production, thanks to a combination of new technology and tax breaks. "Flex-fuel" cars attract a purchase tax of 14%, while buyers of their exclusively petrol-powered counterparts are charged 16%.